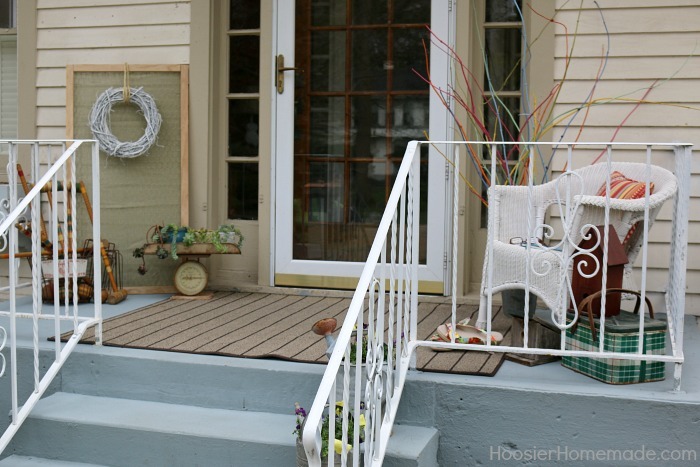 Decorating your Front Porch doesn’t have to be an expensive or time consuming activity. 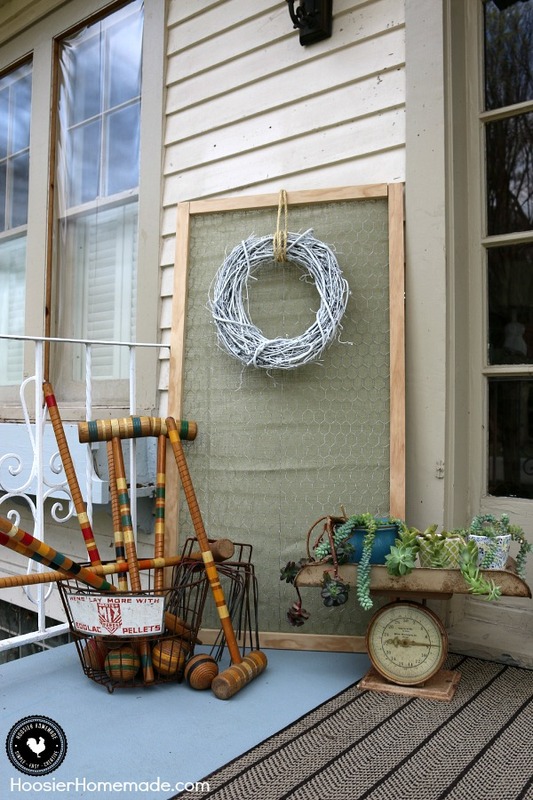 Today I’m sharing some Front Porch Decorating Ideas. Decorating our home with items we already have is one of our favorite things to do. It’s kind of a challenge to see what we can come up with to make our home more beautiful without spending any more of our monthly budget than we have to. And coming up with front porch decor is always fun and one of my favorite activities. You might just be surprised at the impact a few twigs and some spray paint can make to the front of your house. We have lots of people that walk down our street, so we always enjoy having the front of our home looking extra special. We have shared the front of our home quite a few times with you, the Spring Front Porch Decorating gives you a glimpse at what the porch looked like before we painted it last Summer. Like I said, we love decorating with items we already have, and we show you how to do that in just 5 minutes. Decorating for each season is fun, but we also love to decorate for the holidays. Our Fourth of July Front Porch Decorating is an absolute favorite of ours and our fans! And the list goes on and on. But today, we are sharing with you some front porch decorating ideas you can do on a budget and how to use items you have on hand to add color, texture, and interest to your front porch decor, or really any spot in your home. Let’s start with the overall picture, and then I’ll share each part. Last Summer our son painted the porch gray and also painted the metal railing with white spray paint. I’d love to have a whole new porch, much bigger and with wooden posts. But that’s down the road a bit, so we make due with what we have now. My favorite part of the whole porch are these cool painted twigs. We cut them from our backyard, so they didn’t cost anything at all. Hop on over and see how we turned ordinary twigs into extraordinary pop of color. 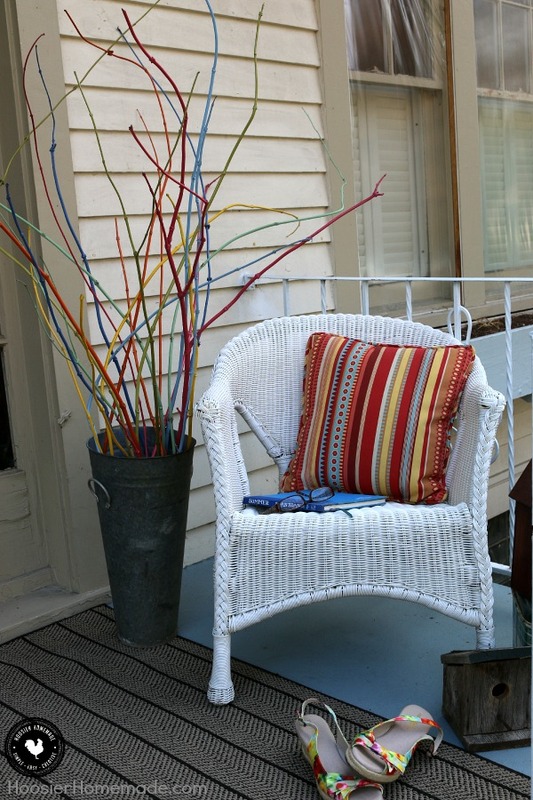 We also brought the white wicker chair back from last year for some front porch furniture and added a colorful pillow for additional interest. On the other side of the door, there was a large open space. So we hunted through the garage to see what decorating ideas we could see. The Vintage Crochet Set is a fun treasure we found at an auction last year. 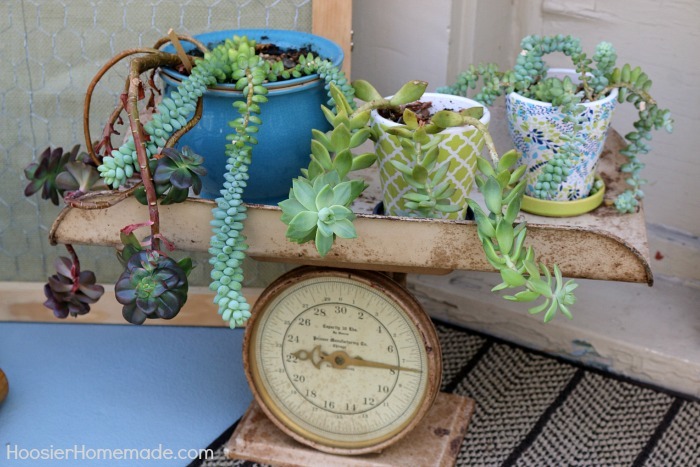 And the old scale with Succulent Plants on top was actually in my kitchen. I figured the plants needed some sun and fresh air so I brought them outside. We needed something tall, so we first dug some old shutters out of the basement. But the color was too dark. Then I remembered the Memory Board that we had hanging on the wall in the Family Room. I had been meaning to update it a bit with some fabric, so this was the perfect opportunity. We simply used a staple gun to add the green burlap to the back. Then we needed a wreath or some flowers hanging on it. Again, after a few tries with ivy and silk flowers, we decided a simple grapevine wreath would do the trick. But the natural color of the wreath just wasn’t showing up well, so Doug grabbed a can of white spray paint and in minutes, we had a whole new wreath. 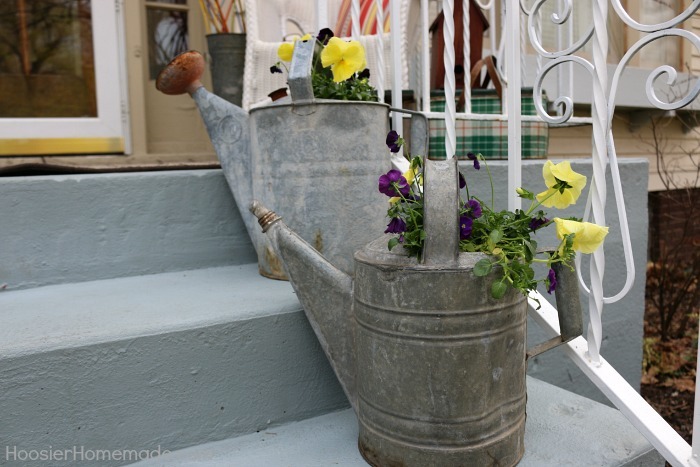 On the steps, we filled our Galvanized Watering Cans with pansies. The plants were the only thing we bought to decorate the porch, all of the other front porch decorating ideas came from everything else we already had on hand. 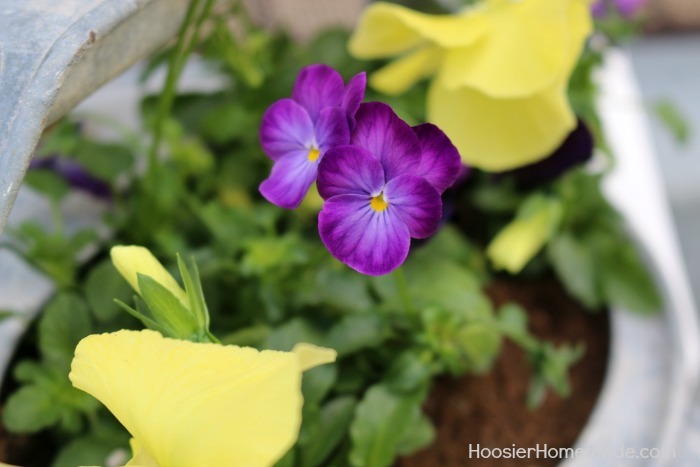 I just love the little viola pansies. Aren’t they precious? They always cheer me up and add just the right amount of color to the front porch. 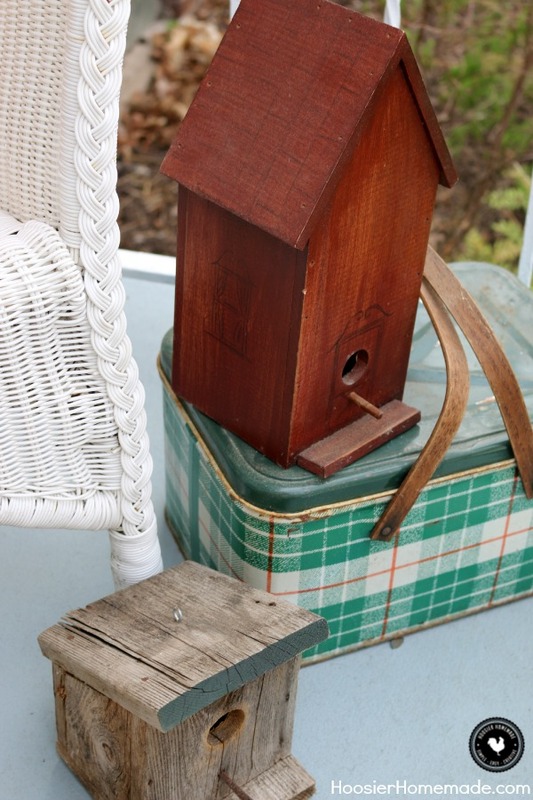 For a little pop of color, I added an antique metal picnic basket next to the chair, and a couple birdhouses that my Dad made many years ago. Here’s a closer look of the grapevine wreath spray painted white. 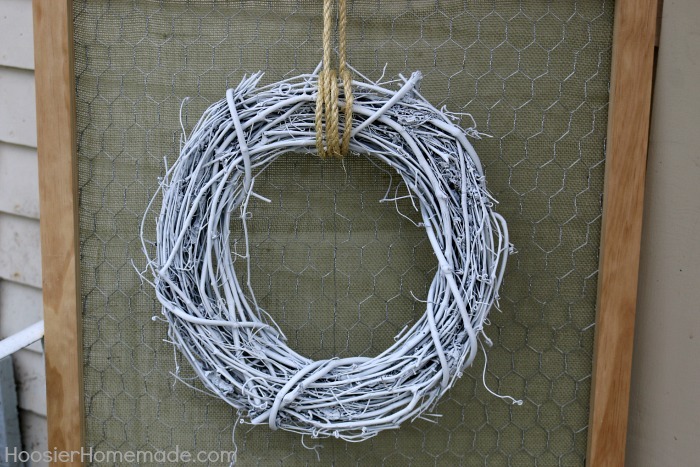 To hang it, we wrapped rope around the wreath a few times, then stapled the rope to the back of the wooden frame. Succulent Plants are some of the easiest plants to grow and care for. These were from when we shared how to build and plant a Succulent Garden. We had replanted them to bring them indoors for the Winter. Well, I hope these front porch decorating ideas have encouraged you to go ahead and search for your own front porch decor. Just remember you don’t have to break the bank to make your porch beautiful. 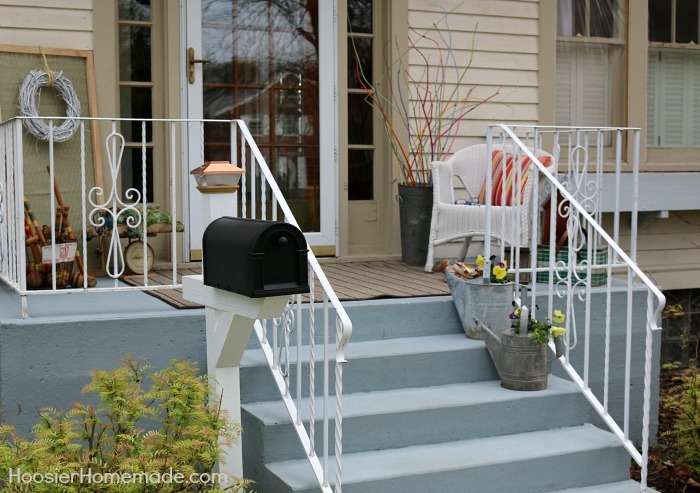 You did a great and simple job on your front porch makeover. I am glad you used what you had on hand. 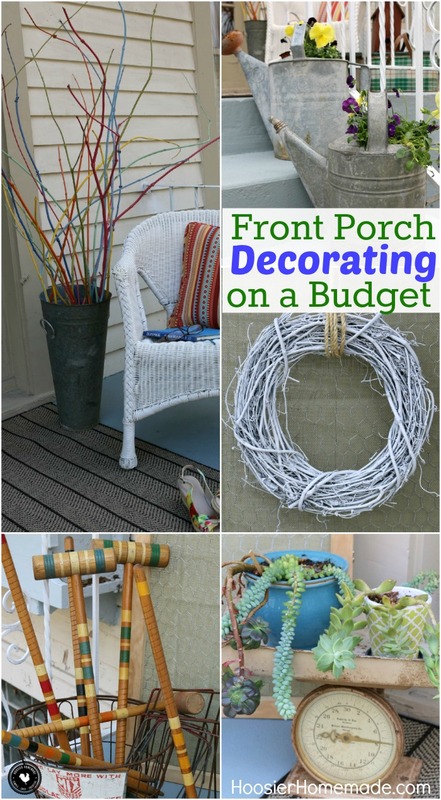 I am trying to decorate my front porch and this gave me some great ideas! I have never heard of Scott’s Outdoor cleaner… I will have to look into. I love the spray painted white wreath and croquet set and spray painted twigs! It all came together so beautiful!